Thyme for Tea: A Cherry on Top! 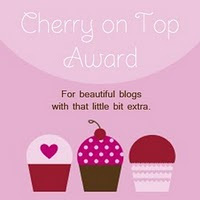 Many Many thanks to Sabrina at Thinking About Loud for awarding me the Cherry on Top Award! 1. Answer this question: If you had the chance to go back and change one thing in your life, would you, and what would it be? There are many many things I would change about my life with the benefit of hindsight. One thing that comes to mind at the moment is that I wish I played my piano more often, practiced harder when I had a teacher, and bought my piano sooner. I lived for nearly 15 years without a piano after I left my parents home. Piano's are so expensive, but I find playing (even just for myself) is relaxing and I believe it must help reduce my blood pressure. 2. The second thing I have to do is, pick 6 people and give them this award. Then I have to inform the person that they have gotten this award. 3. The third and final thing is: thank the person who gave me the award. Many thanks Sabrina, as I said on your blog - sometimes (often) I wonder what I am doing when I blog. So it's times like this that I feel supported and encouraged. Thanks for taking the time to send me this award. Sometimes when I get sent awards, I feel like 'just letting it go', or not responding to it. However sometimes when I get this type of acknowledgement I am affected - encouraged and uplifted. Perhaps there is something in my blog, my personal reflections on life, gardening, books and travel that helps others see more in life or think about something different. Then I feel I can keep going. It's so important to encourage each other - not just in the blogging world - but to encourage the people around us every day. My mum was really good at this when we were living at home - she used to write messages on the mirrors in the bathroom or our bedrooms saying "I love you" or 'You really are beautiful'..... With this award I am reminded, not only to encourage my blogging friends, but to encourage my friends here too. A gorgeous award for a gorgeous blogger and person all around! You really deserve this Tamara! And thank you for including me in this award, I'm really touched by your kindness. Thank you Tamara. I'm so humbled to think that what I write (for myself so often) has made an impression of any sort at all. I will enjoy passing it on too. Why thank you and thank you again. What a lovely surprise on this Monday evening. I shall ponder and respond - some time soon. Thanks so much, Tamara. Your award is well deserved and I'll try to live up to it! Congratulations! Hi Ladies, You a deserved it - you too Karen! Since writing my reflection I have thought more about the role blogging has in my life at the moment. I find, like Chat Noir says while I write mainly for myself, it seems that blogging offers the chance in interact with others, and sometimes our thoughts cross paths. That's community I think - I value this community - thanks. Congratulations on your award, and I always feel uplifted when I visit you (or you visit me). You have a very affirming blog, and style, which is a wonderful gift. And, I like reading your personal reflections.